Orange marmalade mix to make yourself a delicious homemade marmalade. Homecook fruit mix lovers can enjoy again their favorite recipe of marmalade ! This is a simple mix to make a delicious homecook taste marmelade! In this mix, the thin Seville orange slices bring a unique taste and let our taste buds guide us through Seville. The authenticity of Spanish orange, sweat and acidulous at the same time, is in this way preserved in each jar of marmalade. By adding only water and sugar to the mix, with a varying quantity according to tastes, 6 to 8 jar of marmalade can be made in only 30 minutes. The brand is very popular in the UK. This is also the favourite snack of the famous Paddington Bear (icon of child literature). James Robertson and his wife together developed in the late 19th century, on the Scottish lands, a range of marmalades, fruit preparations and "mincemeat", very popular in the United Kingdom. 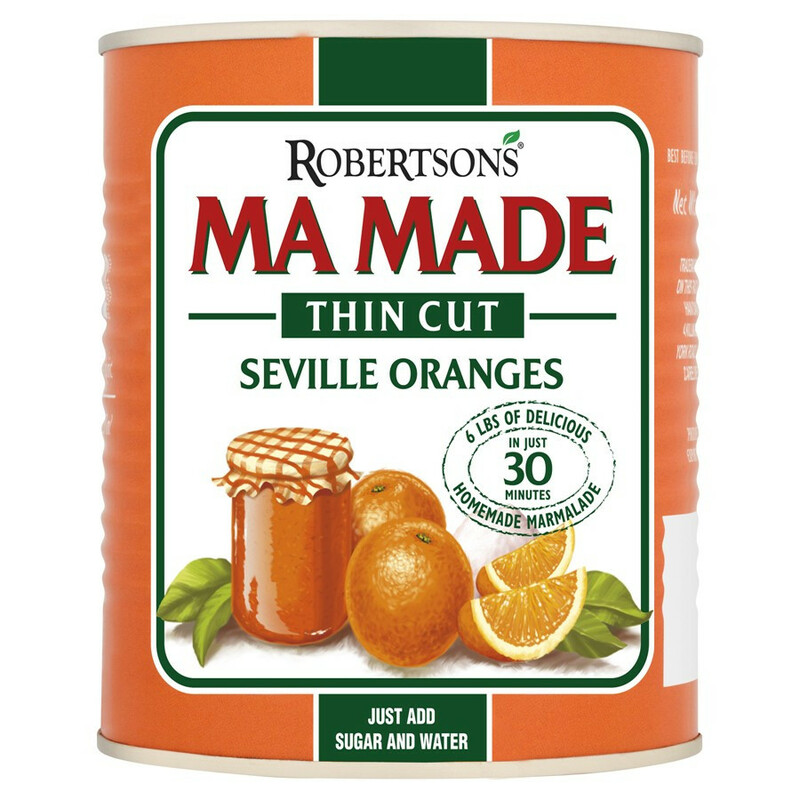 Mrs Robertson had a brilliant idea: she offered marmalade tastings in the back room of the grocery store, she made with oranges too bitter to be sold. The couple had found a way to reduce the bitterness of their oranges while retaining the vitamins of the fruit... Recognized for its natural sweet taste, Robertson's Marmalade has been the official supplier of the Royal family since 1933. Ingredients : prepared Seville bitter oranges (75%), water, acid (citric acid), gelling agent (pectin). 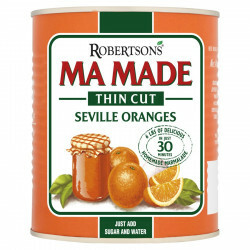 Small white specks may be seen in the contents of this can, these are natural deposits of Seville Bitter Oranges and will dissolve on boiling. 1) Empty contents into a large 8pt (4.5 litres) saucepan, add 3/4 pint (425 ml) of water using the measure mark on the side of the can. 2) Sitr in 4lbs of sugar (1.8kg), bring to the boil stirring continuously with a wooden spoon. 3) Reduce heat, maintain boil for further 15 mins, sti occasionally. Add a knob of butter during boiling to disperse foam. 4) Test for setting - remove from heat, put 1/2 teaspoon of marmalade onto cold saucer and put in cool place. Test after 2 minutes by drawing a finger over the surface, if it wrinkles, setting point has been reached, if not, reboil for a few minutes. Test again. 5) Stand for further 2-3 minutes before pouring into warmed jars. If peel floats, stir contents of each jar. 6) Cover each jar with screw cap, parchment or film.